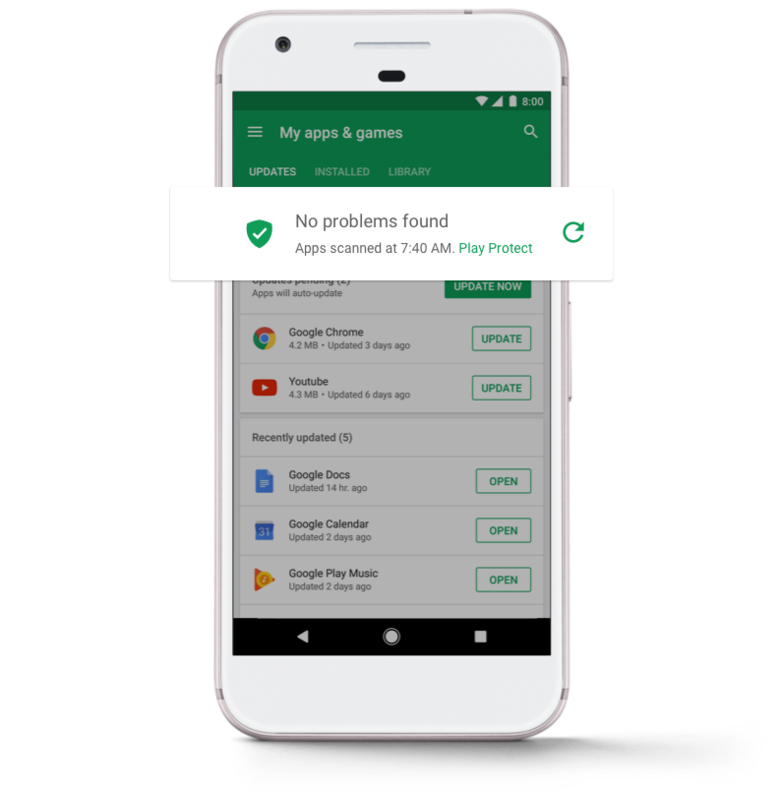 While Google announced the service at its I/O earlier this year, "Google Play Protect" isn’t anything new, rather it's essentially a unification of key security features that has been available on Android for sometime now. It encompasses the several key features at the heart of Android security, such as: malware scanning, lost phone tracking and locking, and Safe Browsing. The Play Protect feature leverages Google’s machine learning algorithm to monitor apps for suspicious behavior, and amply ensures security by removing malicious apps before they can cause any damage.Which feature was formerly known as "Verify Apps" but now being pulled under the same umbrella with the tracking system, Find My Phone. Albeit, the Verify Apps feature had always been hidden away, but with Play Protect will be featured right at the top of the Updates tab of the My Apps & Games section within the Play Store application. Initially, the security mechanism only scanned apps as they were been installed, but the service upgraded to a continuous-scanning model in 2014. Thus, ensuring that even an app that appeared legit at installation could be red-flagged if it later tried to download a malicious module. The new Play Protect will essentially be delivered to all Android devices by the Play Services update. Find out if you already have the new security system by checking the Play Store “My apps & games” page. Google Play Protect: Find My Device and Verify Apps security systems unified?